LuxFeel Carpet is our new range of stunning, and ultimately soft feeling carpets, which we have brought to the Australian market due to popular demand, to complement our Acoustic LuxFeel – Timber Style Flooring range. Four of the Luxfeel Carpet ranges are available in nine beautiful modern colours, as well as a fifth range available in 5 popular colours. The carpets have been awarded our LuxFeel star rating system between 2 to 6 stars, where two stars represent an entry level range, up to 6 stars representing ultimate comfort and softest feel underfoot. Using the most advanced colour fastness techniques, the fibre is infused with rich and deep colour at the manufacturing start. 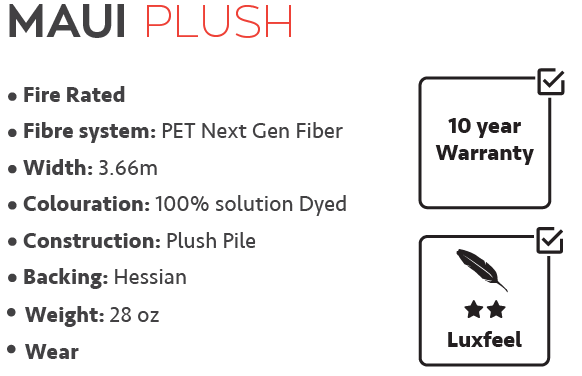 This makes our LuxFeel Carpet range a Next Generation carpet, which is resistant to fade and stains. 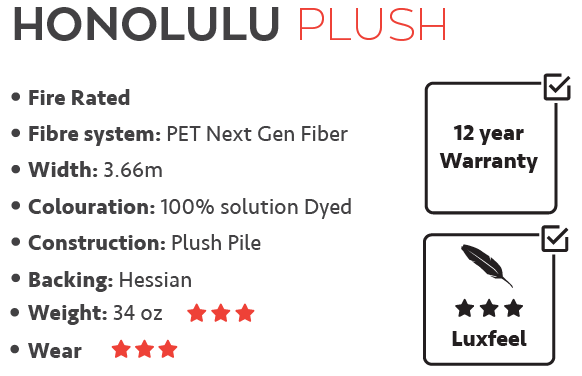 Oahu Plush is our entry level carpet, a great economical option available in 5 unique colours. This stylish carpet is eco-friendly and fade and stain resistant. It is recommended for 3 star developments, and as a builders carpet range. 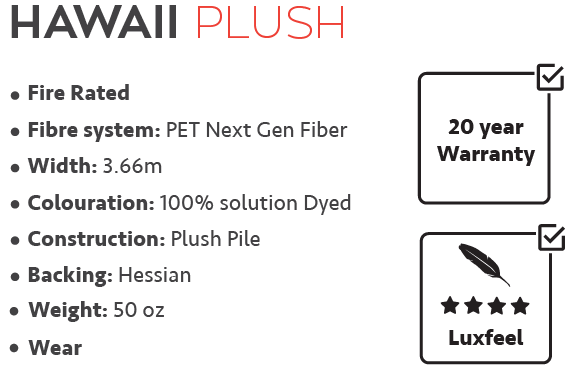 Maui Plush is a beautiful Next Generation carpet. It is an upgrade from our entry level product for an economical and durable choice and recommended for 3 star developments and builders range. 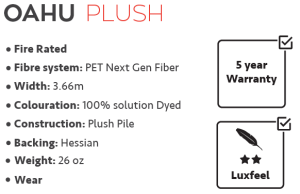 Honolulu Plush has the look and feel of our Essential Collection in a middle level thickness. It is a carpet which is highly versatile, providing long-term resilience. It is recommended for middle range 3 and 4 star developments. 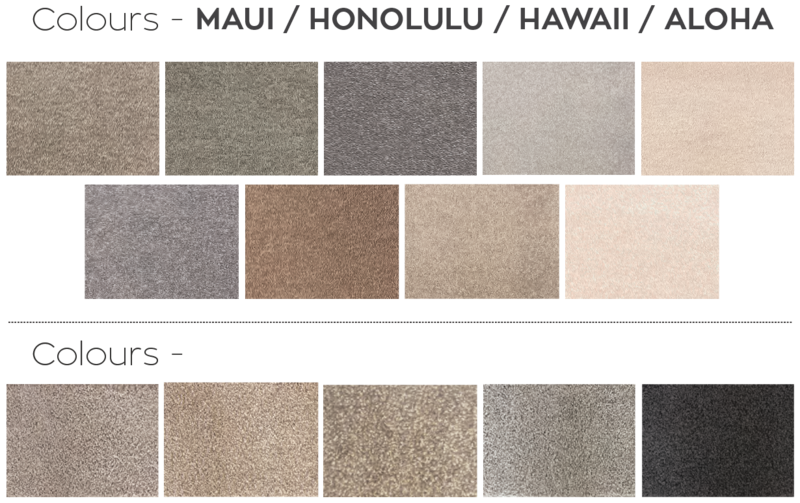 Hawaii Plush is a Next Generation carpet featuring a plush, luxurious softness, which is very comfortable underfoot. It has a dense, fibre-compact construction. This 50 ounce weight carpet provides long-term durability and is stain and fade resistant due to the latest colour technology. It is recommended for 4 and 5 star developments. 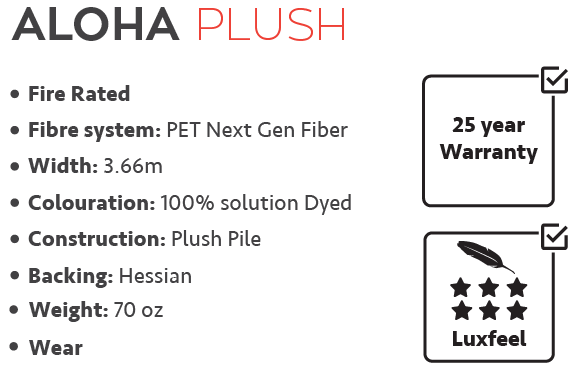 Aloha Plush is our top of the range carpet, that has the highest level of beauty, combined with the luxurious ultra soft LuxFeel qualities for the best comfort and performance available. It features a very soft thick pile, plus a lush underfoot feel. Recommended for premium developments and high-end luxury homes.